In a continued evolution of their quantum computing platform, Rigetti has announced a new version which they call Quantum Computing Services (QCS). One of the goals of QCS is to capitalize on the hybrid classical-quantum algorithms that will be important for the NISQ class of machines. These algorithms, like VQE and QAOA, rely on performing calculations iteratively between the classical and quantum portions of the algorithm and then handing off the intermediate results to the other side. QCS enhances this approach by providing each user with their own Quantum Machine Image that will be capable of running the classical portion on the integrated QCS system at Rigetti. Previously, a user would need to run the classical portion on their own local system and then transfer the intermediate results over the internet to the quantum system on the cloud and vice-versa. This will significantly improve the time to achieve a final result since it eliminates the internet transfer delays. Another improvement is the ability to compile a program to accept different input parameters which are selected at run-time. This could allow running a quantum program multiple times using a range of inputs and it is also handy for the hybrid classical-quantum algorithms mentioned above. Finally, the QCS environment will allow a user to log in and have the Forest programming environment already available and pre-configured on their Quantum Machine Image and eliminate the need for users to go to GitHub and install the Forest environment on their own local computer. However, users will still have the option to install Forest on their own machine, if they choose. The new QCS is expected to be initially available in October to early, invitation-only, users. At that time, Rigetti will be releasing Forest 2.0 which will support the new features along with the first member of the new scalable qubit form factor Aspen family announced in August. The first member of this family is expected to support 16 qubits with subsequent members scaling up to 128 qubits in 2019. As a next step in providing additional applications support, Rigetti has established partnerships with twelve quantum software startups to help develop additional applications and broaden the end user base with a focus on areas such as drug development and training neural networks. One unique feature of their program is that the partners will be able to install their own application specific software on the Rigetti QCS so that it is available for end-users as part of their Quantum Machine Image. 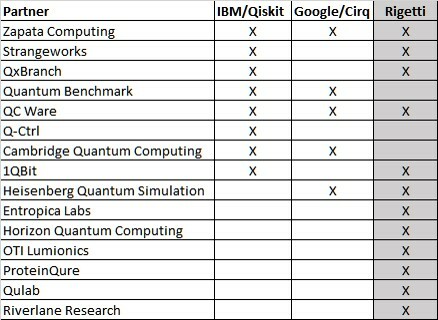 The chart below shows Rigetti’s initial partners and also a comparison of which companies are involved in similar programs at IBM and Google. Finally, as an incentive for end users to demonstrate an application that shows a quantum advantage, Rigetti intends to offer a $1 million Quantum Advantage prize to the first party that can provide a conclusive demonstration of quantum advantage with an application that shows either higher quality, higher accuracy, lower cost, or improved performance over a classical computing solution. Since different parties may define quantum advantage in different ways, Rigetti will announce the final details and criteria for this prize at the end of October. But two important conditions will be that the application must demonstrate the advantage on a real world application rather than a synthetic benchmark and the calculation must be performed on the Rigetti quantum machine. More details on the Rigetti announcement, can be found by clicking here.